A vector graphic (as opposed to a bitmap graphic) is composed entirely of primitive objects — lines, rectangles, text, circles and ovals, and so forth — that retain their identity in the graphic. They can be resized to display at any size and do not pixelate or otherwise “decompose” like bitmap graphics can. The Object2D class is the base class for all the classes that create primitive objects, which include: ArcShape, CurveShape, FigureShape, OvalShape, PixMapShape, RectShape, RoundRectShape and StringShape. Each of these classes allow you to specify borders, fill and fill colors, rotation, scale and positioning. The only problem with this is that the shape doesn’t appear anywhere. It’s just “defined” — ready for your use. 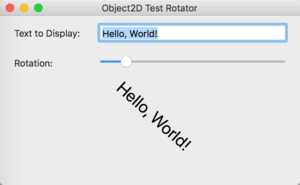 You need to add a command to draw the vector object in another object. As you learned in the previous section, a Canvas is a great place to draw stuff. You can also create composite vector graphics objects that are made up of several individual vector graphics objects. The composite object is a Group2D object—it’s just a group of Object2D objects. Use the Append or Insert methods of the Group2D class to add individual vector graphic objects to the Group2D object. When you are finished, draw the object using one call to the DrawObject method. Vector graphics can be saved using the Save method of the Picture class. Vector graphics are stored as PICT files on macOS and as EMF files on Windows. Saving and Loading vector graphics is not supported on Linux.